I'm pretty happy with my current evening skin care selection. I start by washing my face with Kate Somerville ExfoliKate Cleanser. Even though I was skeptical about the idea behind this cleanser being prep-step before ExfoliKate treatment itself (that exfoliator costs just about enough to be all-in-one treatment: a cleanser, a toner, a serum and a moisturizer). Which is why I only own ExfoliKate treatment in a small size. However back to the cleanser, it’s very gentle and pleasant to use. 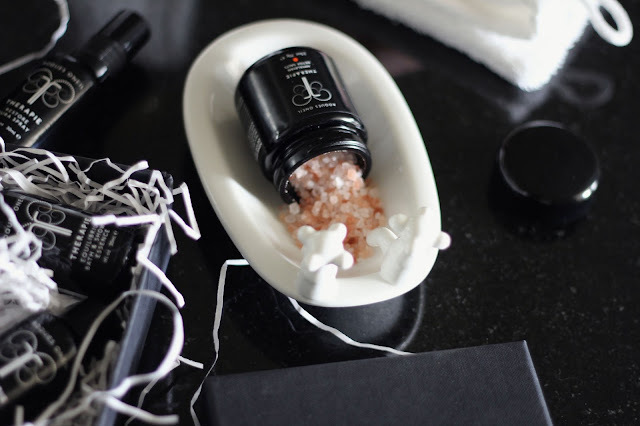 It has small grains that dissolve quickly after you start working the product into your skin. It also never leaves my skin feeling dry. I’ll most likely repurchase it some time again. Next step is Kate Somerville ExfoliKate exfoliating treatment, which I don’t use every single day, only once or twice a week. Even though it's full of great ingredients it may not suit everyone's skin. I’ve found for my skin that I shouldn’t leave it on for a minute as instructed. It works better if I just massage it into the wet skin for a couple of minutes and rinse it off right away. Otherwise my skin will be flaky and irritated the next day. But if I just use it as I mentioned I’m left with smoother brighter skin. Sunday Riley Good Genes is another exfoliating product, which works during the night. It tingles and stings at first, but with time your skin gets used to it. 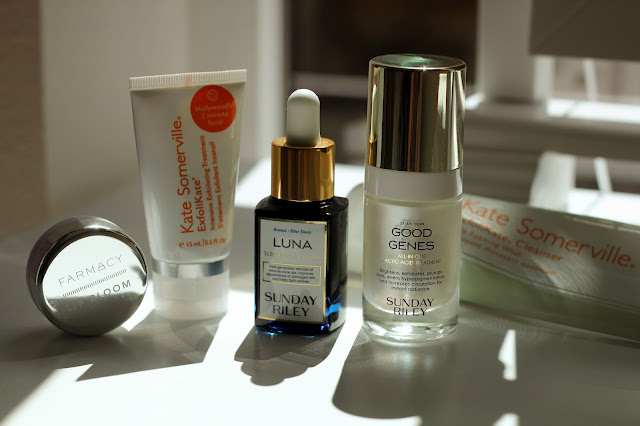 I top Good Genes with Sunday Riley Luna oil, which also helps renewing the skin. By the way, I think this mini size set is perfect (you can find it at Sephora). Both products are half-size, which means they’ll stay nice and fresh while you use them (they’ll last you for more than one month). And the price is better for the set ( $85 for two half-size products vs $110 two full-size products). So, it’s a win-win. I’ve already talked more in depth about this duo here, so I’ll just move on to the next step. As it turns out, it’s a genius idea to keep at least one of your lip balms right next to your skin care. Every night when I finish my skin care routine I grab a lip balm and apply it. Sometimes I can barely be bothered to brush my teeth, which is why all my skin care is in the bathroom. If I was able to drag myself into the bathroom I might as well wash my face and slap on some moisturizer. And if a lip balm turns out to be at reach I’ll apply it as well. The one I’m currently using is Farmacy Lip Bloom in apple and rosemary flavor, very delicious (but the price is up there, in terms of moisturizing properties Bite Agave Lip Mask is better, but this one has a nice selection of scrumptious flavors).